As NASA's next spacecraft to the red planet begins a crucial round of testing in preparations for launch next year, the mission has been given a new name: 2001 Mars Odyssey. "The year 2001 has a special significance to many of us who recall the thrill of reading the book and watching the movie '2001: A Space Odyssey.' We looked forward to the exciting future of space exploration that the year 2001 promised," said Scott Hubbard, Mars Program Director at NASA Headquarters, Washington, DC. "NASA's next mission to Mars, launching in the year 2001, represents the start of a new wave of exploration at the red planet," said Hubbard. "It seemed fitting to name the mission 2001 Mars Odyssey not only in honor of the story and the movie, but also to herald the start of our new long-term journey to explore Mars." Hubbard added that Arthur C. Clarke, author of "2001: A Space Odyssey," enthusiastically endorsed the new mission name. The orbiting spacecraft is designed to find out what Mars is made of, detect water and shallow buried ice and study the radiation environment. The spacecraft begins thermal vacuum testing this week at Lockheed Martin Astronautics in Denver, Colo., where it was designed and built. "It's exciting to have a new name for the mission, and going into the thermal vacuum testing chamber is the next big step for the spacecraft," said George Pace, project manager for 2001 Mars Odyssey at NASA's Jet Propulsion Laboratory in Pasadena, Calif. "We will simulate the full range of temperatures that the spacecraft will be subjected to during its entire mission, from the coldest to the warmest." "We have done several things in response to the NASA review board recommendations to ensure mission success, like adding additional staff and transitioning development personnel to operations. I'm confident we have a solid mission," Pace added. The orbiter will study the kinds of minerals on the surface and measure the amount of hydrogen in the shallow subsurfaces of the planet, which will give scientists clues about the presence of water, either past or present. It will also provide information on the structure of the Martian surface and on the geological processes that may have caused it. Finally, the orbiter will take all-important measurements of the planet's radiation environment so potential health risks to future human explorers can be evaluated. To do this, the spacecraft carries three science instruments: The Thermal Emission Imaging System (THEMIS), the Gamma Ray Spectrometer (GRS), and the Mars Radiation Environment Experiment (MARIE). 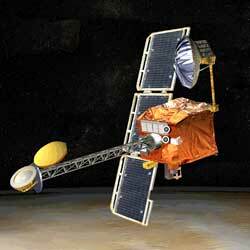 2001 Mars Odyssey is scheduled for launch on April 7, 2001, on a Delta 2 launch vehicle from Cape Canaveral Air Force Station, FL. The space explorer is scheduled to arrive at Mars in October 2001. In August, NASA announced plans to launch twin rovers which will land on Mars in 2003, and later this fall, will announce details of the multi-year Mars exploration program plan. The mission is managed by JPL for NASA's Office of Space Science, Washington, DC. Lockheed Martin Astronautics, Denver, Colo., is JPL's industrial partner. JPL is a division of the California Institute of Technology.